This 6-pack is the best kind! Wool...coordinating wool at that! Luscious colors, patterns, and solids...maybe even a sparkle wool in the mix. Each grouping of six is perfect suited for any project that requires a little bit of wool...or any project that begs for a bit of wool to be added. solids, checks, herringbones, plaids, etc. I have 6 Sweet Christmas 6-packs available. 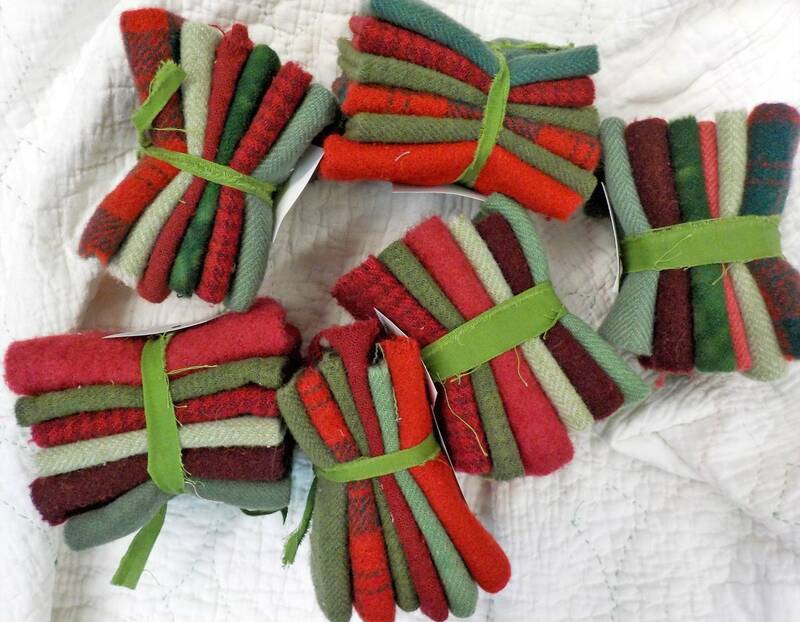 we've put together a variety of Sweet Christmas packs...each pack contains red and green wools...we've added in a couple vintage wools to the mix. Colors are a mixture of cranberry to fiery red with greens being mint, evergreen, and pine. if more than 1 bundle is purchased i will do my best to give you the biggest variety. Please keep in mind that computer monitors vary and final colors may vary.